Increase understanding of how diseases occur. By watching stem cells mature into cells that eventually become bones, heart muscle, nerve cells and other organs and tissue, researchers and doctors may better understand how a variety of diseases and conditions develop. Generate healthy cells to replace diseased cells. Researchers hope they can train stem cells into becoming specific cells so that those specialized cells can be used to regenerate and repair diseased or damaged tissues in people. Stem cells could also be grown to become new tissue for use in transplant medicine. Test new drugs for safety and effectiveness. Before using new drugs in people, researchers could use stem cells to test the safety and quality of investigational drugs. For instance, nerve cells could be generated in order to test a new drug for a nerve disease. Tests could show whether the new drug had any effect on the cells and whether the cells were harmed. Stem cells are the body's master cells. All other cells arise from stem cells, including blood cells, nerve cells and others. Stem cells are master cells of the body — cells from which all other cells with specialized functions are created. Under the right conditions in the body or a laboratory, stem cells divide to form more cells, called daughter cells. These daughter cells either become new stem cells (self-renewal) or become specialized cells (differentiation) with a more specific function, such as blood cells, brain cells, heart muscle or bone. Stem cells are unique — no other cell in the body has the ability to self-renew or to differentiate. Embryonic stem cells. These stem cells come from embryos that are four to five days old. At this stage, an embryo is called a blastocyst and has about 150 cells. These are pluripotent (ploo-RIP-uh-tunt) stem cells, meaning they can divide into more stem cells or they can specialize and become any type of body cell. Because of this versatility, embryonic stem cells have the highest potential for use to regenerate or repair diseased tissue and organs in people. Adult stem cells. These stem cells are found in small numbers in most adult tissues, such as bone marrow. Adult stem cells are also found in children and in placentas and umbilical cords. Because of that, a more precise term is somatic stem cell, meaning "of the body." Until recently, it was felt that adult stem cells could only create similar types of cells. For instance, it was thought that stem cells residing in the bone marrow could give rise only to blood cells. However, emerging evidence suggests that adult stem cells may be more versatile than previously thought and able to create unrelated types of cells after all. For instance, bone marrow stem cells may be able to create muscle cells. This research has led to early-stage clinical trials to test usefulness and safety in people. Adult cells altered to have properties of embryonic stem cells. Researchers have reported being able to transform regular adult cells into stem cells in laboratory studies. By altering the genes in the adult cells, researchers were able to reprogram the cells to act similarly to embryonic stem cells. While this new technique may help researchers avoid the controversies that come with embryonic stem cells, more research is needed. The technique of altering adult cells involves processes that may not be safe for use in people, though researchers are studying safer ways of altering these cells. And whether this new type of stem cells can be as useful as embryonic stem cells remains to be seen. Amniotic fluid stem cells. Researchers have also discovered stem cells in amniotic fluid. Amniotic fluid fills the sac that surrounds and protects a developing fetus in the uterus. Researchers have identified stem cells in samples of amniotic fluid drawn from pregnant women during a procedure called amniocentesis. During this test, a doctor inserts a long, thin needle into a pregnant woman's abdomen to collect amniotic fluid. The fluid can be tested for abnormalities, such as Down syndrome, and fetal maturity. The procedure is generally considered safe for the developing fetus and the mother. Researchers have used amniotic fluid to identify stem cells that could develop into several other types of cells. More study of amniotic fluid stem cells is needed to understand their potential. Embryonic stem cells are obtained from early-stage embryos — a group of cells that forms when a woman's egg is fertilized with a man's sperm. Extracting stem cells from the embryos destroys the embryos. This raises significant ethical questions. The embryos being used in embryonic stem cell research come from eggs that were fertilized at in vitro fertilization clinics but never implanted in a woman's uterus because they were no longer wanted or needed. The excess embryos were frozen and later voluntarily donated for research purposes. The stem cells can live and grow in special solutions in test tubes or petri dishes in laboratories. Studies using adult stem cells are under way. The adaptability of adult cells and their application to treatments remains to be determined. Researchers believe that adult stem cells may not be as versatile and durable as embryonic stem cells are. Adult stem cells may not be able to be manipulated to produce all cell types, which limits how they can be used to treat diseases, and they don't seem to have the same ability to multiply that embryonic stem cells do. They're also more likely to contain abnormalities due to environmental hazards, such as toxins, or from errors acquired by the cells during replication. A stem cell line is a group of cells that all descend from a single original stem cell. Cells in a stem cell line keep growing but don't differentiate into specialized cells. Ideally, they remain free of genetic defects and continue to create more stem cells. Clusters of cells can be taken from a stem cell line and frozen for storage or shared with other researchers. That way, researchers don't have to get stem cells from an embryo itself. What is stem cell therapy and how does it work? Stem cell therapy is the replacement of diseased, dysfunctional or injured cells with either adult or embryonic stem cells. It's somewhat similar to the organ transplant process but uses cells instead of organs. 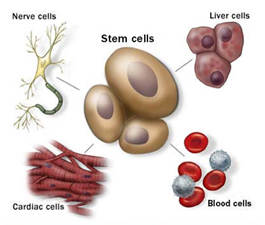 Stem cell therapy is sometimes called regenerative medicine. Researchers grow stem cells in the lab. These stem cells are manipulated to make them specialize into specific types of cells, such as heart muscle cells, blood cells or nerve cells. This manipulation may involve changing the material in which the stem cells are grown or even injecting genes into the cells. The specialized cells could then be implanted into a person. For example, if the person had heart disease, the cells could be injected into the heart muscle. The healthy, transplanted heart cells could then contribute to repairing defective heart muscle. stem cells already been used to treat diseases? Yes, stem cell transplants, also known as bone marrow transplants, have been performed in the United States since the late 1960s. These transplants use adult stem cells. Adult stem cells are being tested in other applications, including a number of degenerative diseases, such as heart failure. Stem cells from umbilical cord blood have been successfully used in clinical trials to treat rare genetic diseases. Therapies using embryonic stem cells aren't yet ready to treat diseases in people. To be useful in people, researchers must be certain that stem cells will differentiate into the specific cell types desired. Researchers, for instance, don't want to transplant a stem cell into a person hoping it'll become a heart cell only to learn that it's become a bone cell, with potentially dangerous consequences. Researchers have found ways to direct stem cells to become specific types of cells, and research into this area has advanced significantly. Embryonic stem cells could also become tumor cells — something that's happened in animal experiments — or travel to a part of the body where they're not intended to go. They also might trigger an immune response in which the recipient's body attacks the stem cells as foreign invaders, or simply fail to function normally, with unknown consequences. Researchers have found ways to avoid these complications and continue studying ways to control stem cells. They are also studying alternatives. What is therapeutic cloning and what benefits might it offer? Therapeutic cloning is a technique to create versatile stem cells independent of fertilized eggs. In this technique, the nucleus, which contains the genetic material, is removed from an unfertilized egg. The nucleus is also removed from a somatic cell of a donor. This donor nucleus is then injected into the egg, replacing the nucleus that was removed, a process called nuclear transfer. The egg is allowed to divide and soon forms a blastocyst. This creates a line of stem cells that is genetically identical to the donor's — in essence, a clone. This technique is also called somatic cell nuclear transfer. Some researchers believe that stem cells derived from therapeutic cloning may offer benefits over those from fertilized eggs because they're less likely to be rejected once transplanted back into the donor, and they may allow researchers to see exactly how a disease develops. No. Researchers haven't been able to successfully perform therapeutic cloning with humans, despite success in a number of other species, such as sheep. Researchers say the field has promise. Stem cell transplants using adult stem cells continue to be refined and improved. And researchers are discovering that adult stem cells may be somewhat more versatile than originally thought, which means they may be able to treat a wider variety of diseases. Studies using embryonic stem cells or embryonic-like stem cells to regenerate tissue and organs in people are just getting started. Researchers are enthusiastic about the potential for regenerative medicine treatments.